Academy Award-winning director Peter Jackson (The Lord of the Rings Trilogy) brings his sweeping cinematic vision to King Kong. Naomi Watts, Jack Black and Adrien Brody star in this spectacular film filled with heart-pounding action, terrifying creatures and groundbreaking special effects unlike anything you've seen before! Get ready for breathtaking action in this thrilling epic adventure about a legendary gorilla captured on a treacherous island and brought to civilization, where he faces the ultimate fight for survival. $50.130 million on -unknown- screens. After the enormous success of the three Lord of the Rings films, director Peter Jackson could take on his dream project: a remake of 1933’s King Kong. This project almost got off the ground in the late Nineties, but it didn’t happen and the Rings trilogy took priority. That series made Jackson an “A”-list director and allow him to write his own ticket. Thus his Kong became the common choice as the big flick of 2005. It hit the screens with glowing reviews and predictions that it would dominate the box office and earn serious Oscar consideration. However, Jackson’s Rings success wouldn’t quite repeat itself. On the surface, Kong did well. It made $217 million in the US and grabbed four Academy Award nominations. Those were all four the usual technical categories, though, and these days $217 million just isn’t a great take for this kind of blockbuster. Really, anything short of $300 million rendered Kong a disappointment, so it came up decidedly short of its anticipated goals. It ended up fifth in the year’s box office charts, a spot lower than most people dreamed. Unfortunately, all of this seems to have affected the public perception of Kong. Before release, it looked like it’d be an unqualified success, but now the naysayers appear to dominate. Box office success or failure clearly impacts on the way people view the movie itself, and now it looks like lots see Kong as a lackluster flick. Balderdash, say I. Not for a second will I claim that Kong doesn’t suffer from some flaws, but I think the whole package adds up to a very satisfying experience. Set in 1933 at the height of the Great Depression, we meet adventurous movie mogul Carl Denham (Jack Black). He wants to film another spectacular but he runs into a mix of problems. For one, he lacks a finished script, as writer Jack Driscoll (Adrien Brody) hasn’t completed one. Denham also lost his leading lady, and his financial situation makes it tough for him to do much about any of these issues. However, Denham’s fast-talking savvy allows him to sucker Driscoll, charm and cast vaudevillian ingenue Ann Darrow (Naomi Watts), and escape on a boat just ahead of the dudes to whom he owes money. Denham plans to take them all to a fantastic location called Skull Island. There they encounter vicious natives and an assortment of prehistoric beasts. Among them they find an enormous gorilla referred to as Kong. Ann ends up in his clutches, and the others lead an attempt to rescue her. The movie follows their pursuit and subsequent drama. Since I think many now view Kong in a negative light, let’s start off with the film’s problems. What goes wrong here? The flick’s main drawbacks stem from its length. I don’t think that a running time of more than three hours is a flaw in and of itself. To be sure, that factor didn’t cause concerns during the Rings pictures. However, Kong really does drag at times. Most of the slow spots turn up in the excessively plodding first act. The expedition takes forever to get going, and that’s one area which the original Kong excelled. It zipped through the exposition to get us to the fun. It told us just as much as we needed to set up the characters and situations, but it didn’t tire us with those elements. The 2005 Kong falters in this area. I don’t know if I’d say it bores us during the first hour, as there’s enough interesting material to keep our attention, but I will admit the flick tests our patience. The fact many of us already know the story doesn’t help. It’s not like we aren’t aware where the journey will lead, so we want to get there even more quickly. Perhaps Jackson’s pacing pays off in ways I can’t see and the second and third acts would work less well without the long build-up, but I imagine the flick still would’ve succeeded with less exposition. Once our characters finally get to Skull Island, however, the movie improves radically. Jackson gets to indulge his love of over the top action and he does so with all the skill he displayed in the Rings movies. I won’t say that Kong is a non-stop rollercoaster ride for its last two hours, but it sure pours on the thrills. Key among these is the spectacular “V-Rex” fight. I don’t want to discuss its specifics too explicitly as I want new viewers to see it without much foreknowledge. That’s how I examined it theatrically, and it made a big difference. The flick took this battle to incredible heights and left my jaw on the floor. I couldn’t – and still can’t – get over the amazing level of action and power Jackson packs into this sequence; I’d argue it’s one of the all-time great segments of this sort. Not that the rest of Kong’s second and third hours disappoint. The film offers a great level of action and drama as it pursues its familiar story. Jackson may not reinvent the wheel when it comes to the movie’s plot and characters; both change a little from the 1933 flick, but this isn’t a radical reimagining. Jackson does bring the film more in line with modern styles, though, and manages to turn the action into something special. That’s what ultimately makes the 2005 King Kong a winner. The film lacks the innovation of the original, and its excessive running time means that it lacks that flick’s popcorn-chomping consistency. Nonetheless, it recovers from a slow first act to become a memorable experience. Kong isn’t Peter Jackson’s finest hour, but it achieves most of its goals. 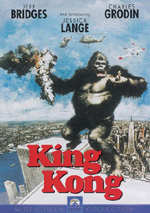 King Kong appears in an aspect ratio of approximately 2.35:1 on this single-sided, double-layered DVD; the image has been enhanced for 16X9 televisions. Maybe someone else will find flaws in this transfer, but I sure couldn’t. Kong went with a restricted, somewhat golden tone. The movie rarely featured bold colors, as it usually went with subdued hues. Even the greenery of Skull Island looked a bit pale. I didn’t regard this as a problem, though, since the DVD clearly replicated the movie’s intended visuals. The colors were appropriately vivid when necessary and seemed accurately depicted. Black levels also came across well. Dark shots demonstrated good depth and clarity. Low-light shots were nicely displayed and seemed clear and adequately visible. Shadow was clean and tight. Given the darkness of so much of the film, those components became especially important, so their high quality was an important factor in the success of the transfer. Overall, the image of King Kong appeared virtually flawless. This is about as good as you can expect a standard-def DVD to look. And the audio didn’t disappoint either. At all times, the Dolby Digital 5.1 soundtrack of King Kong worked exceedingly well. The soundfield appeared very active and involving. All five channels presented lots of material that kept the viewer at the center of a realistic and immersive world. Elements seemed appropriately placed and they blended together well. Planes and flying creatures soared from location to location accurately, and other pieces popped up in their proper places too. The whole thing meshed together quite nicely, and the piece worked swimmingly. Not surprisingly, fight sequences were the most impressive, but the entire package seemed strong. Although I feared the bass response of Kong would replicate the theatrical DVD of Fellowship, that wasn’t the case. Was the low-end loud? Without question. Was it overcooked and too heavy? Not in the least. The mix featured clean, concise bass at all times. The low-end was smooth and extremely effective. At no point did it threaten to dominate the audio, as the bass fit in with the rest of the track well. All of this combined to make the soundtrack of Kong a complete winner. Only a couple of minor extras round out this single-disc edition of King Kong. The Volkswagen Touareg & King King lasts two minutes, four seconds. This shows how some parts of the film’s crew created a commercial on the same sets. We also watch the final product. It’s little more than a slick way to get us to view an advertisement. ”Wish You Were Here” fills 68 seconds. It really is nothing more than a commercial that advertises New York City. 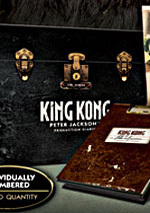 Neither of the DVD’s extras has much to do with Kong; if you want that material, head to the two-disc Special Edition. Peter Jackson’s King Kong seems destined to be perceived as a disappointment in many ways, but I don’t think it deserves such a fate. Though the movie sags during its first act, the excitement and thrills of the subsequent two hours make up for its flaws. The DVD offers virtually flawless picture and audio but skimps on extras. 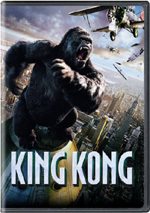 I definitely recommend Kong, though I’d push fans to get the two-DVD Special Edition. It offers the same movie disc but also includes a second platter with many fine extras. If you really don’t care about the supplements, you may as well get whichever one is cheaper, but for most folks, I think the Special Edition is the more sensible purchase. 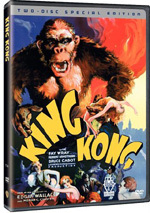 Final pursestrings note: rumors abound that a deluxe extended DVD of Kong will materialize in the future. As I write this at the end of March 2006, these hints clearly do reside in the realm of rumor. Even though Peter Jackson himself has indicated a desire to release this kind of DVD, there’s no official confirmation that it will happen. I’d bet it’ll occur, though.